Pacific Rim makes no excuses for itself, nor should it. The premise of giant monsters coming from the sea (or outer space) to terrorize Tokyo was hatched after World War II as a means of dealing with the cultural terror of nuclear power. Dubbed kaiju films (Wikipedia translates the term to mean “strange creature”), the genre includes giant monsters of various forms and temperaments. The most famous is of course Godzilla, who first appeared in 1954. Growing up, my brother and I were introduced to the giant radioactive lizard by our father. We then followed his adventures, as well as Gamera – who if I remember correctly is a giant, fiery space turtle – with great gusto. The draw of the films was two-fold: 1) Strange creatures with strange powers, and 2) Watching them knock down buildings and get tangled in power lines. There were plots to these films, though they were usually handled by men in black ties standing around control panels discussing the morality of killing beasts transformed by man’s science. My brother and I ignored these parts, being both too young and too bored by the static opera to understand their dubbed angst. All we knew was that when the tiny twins stepped out of the clamshell, they could summon Mothra. Why was not really an issue for us. We were waiting for Godzilla to smash things. Giant robot movies also have a long history. Anyone who understands the square-cubed law, engineering, thermodynamics, and military budgets can explain to you why a Gundam is an untenable weapon – but that has very little to do with how cool it looks swinging a giant laser scythe. Giant robots and giant monsters are fictions with no pretense to reality. They exist because it’s fun to watch two men in rubber suits slug it out over model cities. Writer/director Guillermo del Toro knows that and his Pacific Rim is a big budgeted love letter to both kaiju and giant robo genres. He has geek credentials, he knows his anime, his video games, his model kits, and his Lovecraft, so there was really no better man to make this movie. And as with most del Toro films, it certainly does not suffer from a lack of ideas. There are plenty of ideas in this homage, plenty of intriguing set pieces, characters, equipment, gooey monsters, and style. Much of these things, however, are subsumed by titanic boxing matches. Del Toro has a very big story to tell us and he, perhaps wisely, chose to tell it in only two hours’ time. Pacific Rim sets out its premise in very short order, showing us how a giant monster emerged from a dimensional rip under the Pacific Ocean and laid waste to San Francisco before being destroyed six days later. This was the first of many attacks. Not wanting to despoil the planet by hurling atomic bombs at these things, a new method was needed to combat the kaiju. Jaegers (German for “hunters”) were built by the newly formed Pan-Pacific Defense Force, robots with human pilots. Over a decade passed with Jaegers trouncing the kaiju and becoming heroes as well as action figures. But now, in 2025, the exorbitant cost of maintaining the Jaegers, as well as the increasing size and ferocity of the kaiju, have led the Pacific governments to shut down the Jaeger program in lieu of building an enormous wall around the Pacific to keep out the unwanted aliens. Because that’s worked so well for us before. The film runs through this exposition in a gravelly five minute voice over by Raleigh Becket (Charlie Hunnam), a former Jaeger pilot and the surviving half of Gipsy Danger’s Jaeger team. The most interesting spin on this nostalgic premise is “the drift,” the process that merges pilots’ thoughts and memories. A Jaeger is so immense that a single pilot cannot handle the mental strain of controlling it, and so a team is required, each pilot corresponding to a hemisphere of the brain. A strong team has no secrets from each other and fight as one. This, along with the multiculturalism of the Pan-Pacific Defense Force, is Del Toro’s sole political statement in the film: that we are all connected, no matter our nationalities, and that only by coming together can we survive. This sentiment however, like so much in Pacific Rim, is explored no further. Sentiment and ideas are jam-packed in this rock ‘em, sock ‘em adventure, and the main flaw in Pacific is not that its style substitutes for substance but that its substance is rarely given a chance to breathe. There is an entire world of possibilities and characters here – and Del Toro has confirmed that he cut nearly an hour of footage from the final film supporting it. Though the director has never had a great ear for dialogue (in his English films), the actors do the best that they can, with no one truly distinguishing themselves. There just isn’t enough time between the monster battles. This is not to say that Pacific Rim lacks for fun. If we’re grading this film on its kaiju pedigree the thing is the heavyweight champion of the galaxy. Just as my brother and I were renting these films for Godzilla and nevermind the men in ties, Pacific is streamlined to spend the maximum amount of time in the robots, fighting monsters. At the end of the kaiju war, the opening monologue sets us up for the boom, and the boom is indeed where Pacific’s head is at. Del Toro, director of Pan’s Labyrinth and the Hellboy movies, is a visual original. His monsters can always be expected to push the envelope of what we’ve seen before and his creative team have outdone themselves in their cast of colossi. The kaiju glow and bleed and sport eyes in odd places and slither and punch with beautiful ferocity. The Jaegers too are individual to their countries, massive and majestic. But surprisingly, Del Toro’s smooth direction has been chopped up as he’s scaled up his action. Most of the Jaeger-Kaiju fights (and there are many) are frenetic bouts staged in darkness and rain, edited so that who is gaining the upper hand on whom is sometimes lost in the spray. Most disappointingly, many of the shots are so tight that the scale of the battle is irrelevant. The most effective and by far most thrilling fight takes place in the city of Hong Kong where the neon marquees shed light on Gipsy Danger and Otachi. It is this fight and this fight alone where the action is not only clear but we actually feel something for our Jaeger pilots. Though it must be said that each battle truly attempts to top itself. Just as with The Hobbit, it’s difficult for me to grade this film down too fiercely when so much love and effort has been invested in it. 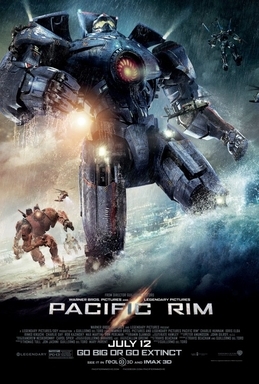 Unlike The Hobbit, Pacific Rim is not too long; it’s just the opposite. There are characters aplenty here, ideas behind the monsters, and a story that justifies the action. Did Del Toro make the right decision in filming just the end of that story? Would it have made for a stronger narrative if he began at the beginning? Probably. But we would not have had as much boom for our buck. It is an imperfect film but a great kaiju movie, one of the greatest for sure. What the hell am I talking about? Am I looking for transcendence in a giant monster movie? My eight-year-old brother and I would have loved this film to death and played it until the VHS was a crispy pile of magnetic tape. The part where Gipsy Danger punched Leatherback in the head was awesome. And it has a giant chain sword! What about when it was in the Earth’s atmosphere screaming down to China like a robo-comet? Stop reading, go see this movie, and if you don’t have small children to take, don’t you dare try to be an adult about this. Go have some fun, America. *Spoiler: Admittedly, I was disappointed that the film’s climax involved the exact same nuclear ploy as Independence Day, Oblivion, and The Avengers. It ended too neatly for me, but I award bonus points for keeping Raleigh and Mako (Rinko Kikuchi) professional partners instead of lovers. Finally saw this movie in its entirety tonight and was f***-ing amazing!!!!! Although when Stryker detonates, it only killed one Kaihu that was already half dead, so I think they could’ve fought a bit more.